Keeping with Women in SF&F Month tradition since she first started the recommendation list project in 2013, Renay is once again kicking off this year’s series of guest posts! Renay contributes to the wonderful site Lady Business, the 2017 Hugo Award winner for Best Fanzine, where she writes enthusiastic, thoughtful coverage of science fiction and fantasy (and provides excellent recommendations!). She also co-hosts the Hugo-nominated Fangirl Happy Hour podcast. Hello, friends! 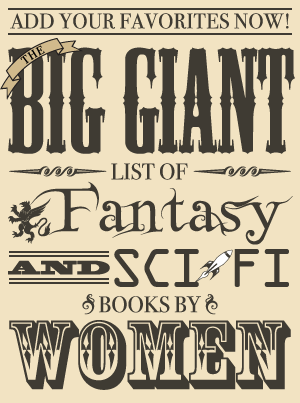 Welcome to Women in Science Fiction & Fantasy Month—2019 edition! Kristen is very kindly allowing me to write to you once again to prep you for the next few weeks of great essays and lots of recommendations by a multitude of awesome guests. Thanks, Kristen, for everything! As per usual, I’m stoked for this year’s event, because it involves one of my favorite things ever: making lists. I love a good list. But as I was getting pumped about this year, I started thinking about the power of lists: tables of content in anthologies and magazines, award lists, rec lists, and how history is made. Maybe that’s no surprise; I’m a historian with a degree and everything! I’m always like, “I will daydream about the intricacies of history for an hour!” And then it’s been three and I’m behind on work. Recently I was working on a transcript for my podcast, Fangirl Happy Hour. It was Episode #105, and we talked to Martha Wells about her experience in fandom and in publishing as a woman writer. One of the discussions we had was about the cyclical nature of things. Martha pointed out that it’s not that things are bad and as time moves on they shift toward good and the bad is all gone. That’s too binary a way to look at the past. It’s more complicated and nuanced. The bad is never truly gone. The good is never all-encompassing. In the 20th century, there were tons of women writing science fiction and fantasy, but over the decades, they were erased. It’s not that they weren’t there—it’s that the myth making machine that is society and culture simply erased them from the history of genre that rose from decade to decade, until the narrative became, “Well, there just weren’t that many women writers!”. This happened to women writing in magazines, women writing short fiction, and women writing novels. Whether through apathy or active sexism, their work was suppressed, brushed aside, and buried, available only to those who were there or people later on who had the resources—time, money, and energy—to dig for it. Partly the reason I’ve been thinking so deeply about history is that I spend so much time in my political organizing work with people who wonder how it all got so bad so fast, not only in the United States, but around the world with the rise of nationalism. But it didn’t get this bad as quickly. It was a series of choices, a backlash to progressive strides and fear from people who hated change, people with power choosing to frame marginalized groups as rare occurrences, and the people who were invested in the good thinking their work was done—surely things would tick along just fine from here on out. There are so many examples of this in history if you take a good look. The history of the world is a cycle of progression and backlash, people seeing the cycle but forgetting that it would come again, and being shocked anew when it repeated itself. History is just stories, after all, and stories can be controlled and their narratives changed. Science fiction and fantasy fandom is a microcosm of the world, but I can see the same currents within our corner of the SFF internet. From the rise of marginalized voices being honored at awards after too long shunted to the sidelines, to the backlash from fascists keen to suppress them and wipe their efforts from genre history, to the inevitable pushback and expansion of progressive ideas and positions—it’s all a cycle and that was just this century, in the last ten years! We’ve been here before. As Martha pointed out on the podcast, things for women writers in the 1990s weren’t as dire as they became again at the turn of the century, and up until 2008 and 2009 when marginalized writers started to make noise again and demanded a seat at the table and in our history. In certain parts of fandom it feels like we’re making good strides, but as ever, the work is never done. So yes, I’ve been thinking a lot about history. How do we avoid falling into the trap of thinking our work is done? How can we stake a claim, as marginalized people, on our place in genre history? Those are some big questions with wide ranging answers, and I certainly don’t know what they would all be. But I do know that one way to do it is to keep having conversations. Keep remembering the past and telling people about it. Look to the future and imagine the things we have now that we want people to be able to remember. Not everything will make it—it never does—but since this cycle will no doubt repeat itself again in the future it pays to prepare for it now in whatever way we can. One of my favorite ways is—yes, you guessed it—lists. Especially crowdsourced lists. Last year, like many years before, we collected books by women writers that people loved. And in 2019, we’re doing it again: for the month of April you can add books by women writers that you’ve loved and later it will be combined with the books already there, mixed in recs of Octavia Butler and Kate Elliott, Mary Shelley and Kameron Hurley, and Ursula K. Le Guin and Aliette de Bodard. This is one way of remembering the past and writing the story for the future to look back on. It’s small, but history is a collection of small stories of human endeavors. I’m so happy to contribute to this one, and I hope you’ll join in as well. « It’s Time for Women in SF&F Month 2019!